SHAWNIGAN LAKE — It was a bounce-back match on many levels for the host Stags, not the least of which was its 24-13 loss to Victoria’s Barbs in an epic top-tiered B.C. title derby match last June. 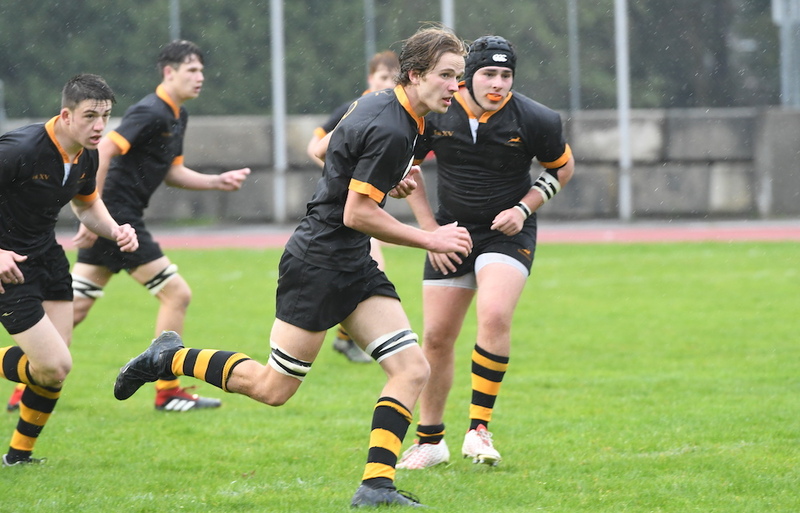 Will Mann scored three tries while Jamin Hodgkins scored once and booted converts on six of eight major scores as Shawnigan triumphed in decisive fashion over the visiting Barbarians in B.C. Premier League action on Friday. “We were able to put together some nice phases and score some cracking tries,” admitted Stags’ head coach Andrew Doyle, whose team also rebounded from heart-stopping 15-13 loss to St. George’s a week earlier in the Premier opener for both teams. Barbs’ head coach Peter Atkinson, guiding a team coming off a narrow 25-22 loss in its Premier League opener a week ago against Carson Graham, tipped his hat to the Stags. Brenner Kalava, Ted Champion, Graeme Norris and Ciaran Breen also scored a try apiece in the victory. Jack Carson, Nick Bamford and Owen Smith all scored tries for Oak Bay, with Carson also kicking a pair of converts. The Barbs get right back to Premier League business on Tuesday when they play at Surrey’s Earl Marriott Mariners. Shawnigan’s full first XV won’t take to the field again until its next Premier League game, May 3 at Carson Graham (Klahanie Park). SURREY — Led by the fierce tackling and determined open-field runs of Austin James and Parker Burt, North Vancouver’s visiting Eagles went to 2-0 in Premier League play on Friday, building a 19-0 lead before the young Mariners knew what had hit them. “That was an eye-opening experience for our boys,” said Mariners head coach Adam Roberts. No. 8 Sam LaRue, captain Erik Neihbur and twins Talon and Takoda McMullin all turned in solid performances for Earl Marriott. The Eagles will host current No. 1 St. George’s in an April 24 Premier League tilt at Klahanie Park. KAMLOOPS — Scoring the game’s final 14 points, all in the second half, and all in unanswered fashion, Vernon’s visiting Maroons built a little early-season momentum with a victory over the host Saints in an exhibition match. Quaid Willett, Dayton Ingenhaag and Reyaan Siddique all scored tries for the winners while Evan Trottier kicked a pair of converts. Clarence Fulton opens Okanagan Double-A league play Wednesday (4 p.m.) in Kamloops against the host South Kamloops Titans.